In his article “What is Journalism? How is it linked to society?” McQuail gives a couple of characteristics of news. Some requirements of news are, according to McQuail, that news needs to have novelty and relevance to or relevance for current events. It needs to have neutrality of perspective and it needs to be independent from sources. Travel journalism doesn’t meet one of these requirements. Mostly travel journalism aims more for entertainment than for newsworthiness. And also is travel journalism often not been considered as neutral or independent. To finance their travels journalist are often sponsored by the company or organization they have to write an article about. The problem is that if for example the PR agency of the city of Warsaw pays your trip, are you then still able to write down all the things you don’t like about the city? At least some people would doubt your integrity if you write a positive review about the city. So the question arise, should travel journalism be removed out of the newspaper or should the characteristics of McQuail be extended? Did neoliberalism paved the way for blogging? In her article ‘the places where audience studies and production studies meet’ Mayer discuss two historical trajectories which were important in the consideration of cultural values versus the economic value. Especially the first path that she discuss is quite interesting. Mayer says that ‘the consideration of economic value as capital and property to the exclusion of all other values has been associated with the growth of neoliberalism’. But besides the exclusive factor that neoliberalism gave to the economic value it also paved the path for another thing which is more important for production and/or audience studies. According to the Flamish psycholigist Paul Verhaeghe neoliberalism makes sure that people are taking slowly on more and more activities into their own hands. Because of neoliberalism the market started to control our lives. We became consumers instead of citizens. According to Verhaeghe the only way to end this is, is to take the activities into your own hands. And more and more people are doing this. ‘Authentic’ or ‘handcrafted’ products are becoming more popular. But also the way that people gather the news is changing. In a couple decades platforms like Twitter, Facebook and blogs will be used probably by the mass to gather their news instead of newspapers and TV news bulletins. Is this also a result of neoliberalization? Mayer, Vicky. “The Places Where Audience Studies and Production Studies Meet.” Television & New Media 17.8 (2016): 706-718. In their article: ‘Balancing act: Learning from organizing Practices in cultural industries’ Lampel, Lant and Shamsie investigate the role of the management in cultural industries. They outlined the tasks of a manager and the way the management is doing her job. But they did not mentioned the necessity of the existence of managers in the cultural sector. A dutch TV Show, ‘Tegenlicht”, made an episode two years ago, which was called ‘The end of the manager‘. In this episode they were looking to the firm of the future. According to the makers of the episode the firm of the future was a company where the power was given to the employees and were the management was removed. There employees were feeling more responsible and were more happy and the company was more able to innovate. A win-win situation. But should this also be the future of journalism? Why does a newspaper need a management? I would say that journalist are experienced enough to decide which way is the best way for a newspaper to follow. Or do journalist already enjoy a lot of freedom, and is the role of the management not that big at all? Why a shift towards blogging is not the best option! In “The cultural logic of media convergence” Henry Jenkins argues that we need to shift from a politics based on culture-jamming towards one based on blogging. A shift from disrupting the flow of media from an outside position towards actively shaping the flow of the media. Blogs from the audience really can be an asset for the media culture. Most of the time they are more direct and they have a different point of view than the traditional news media. They can go more into depth on a certain topic than a traditional newspaper can do. But a shift towards a politics based on blogging also has its dangers. In an era were fake news is the main topic in mediastudies and it already have influenced public opinion and some political campaigns it is important to know that you can trust the things you read. And despite some shortcoming I still believe that traditional news media still remain more reliable and trustworthy than blogs. In the Westminster Attacks in London from the 22nd march a Dutch newspaper had a live blog on his website. In this blog they used lots of information from the ‘audience’. But because of this they made a lot of painful mistakes. The information in the blogs was incorrect and not checked. They put the wrong name and picture of the suspect on their website. They declared to many people death. Or they shared information about the attack without any news value. The content that is placed on the internet, in blogs, on certain topics is that much that a common reader does not know anymore what he should read or what he shouldn’t. The traditional media needs to trust on the expertise of their own journalists and make compact news, something what blogs made by the audience are most of the time not able to do. Jenkins, Henry. “The cultural logic of media convergence.” International Journal of Cultural Studies 7.1 (2004). A former member of parliament of the Dutch party VVD, Ybeltje Berckmoes, published a book this week about the time she served in parliament. In her book she gives an horrific image of the party culture of the VVD. During her time in parliament she was forced to sit in her room and watch Netflix, the only thing she was expected do was to vote the way the leaders of the VVD told her too. As a way to present her book to the world she gave an exclusive interview to ‘De Telegraaf’. In this interview she said a lot of interesting things about the elite of the VVD and the things she was forced or forbidden to do during her time in Parliament. 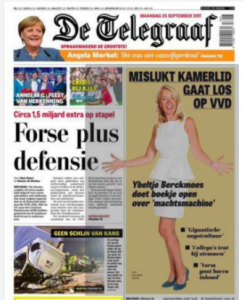 But nevertheless ‘De Telegraaf’ choose to use ‘Failed member of parliament is going loose on the VVD’ as the header on the frontpage. In ‘News Framing Effects and Emotions’, Schuck and Feinholdt, state that news framing refers to the observation that media can portray one and the same topic in various ways. By using certain headers ‘De Telegraaf’ wants to frame Berckmoes as a failed, rancorous ex-employee instead as somebody who has lots of interesting things to say about the main political party in Holland. Thereby the public take her story less serious. The focus of the article, is through the header shifted from the dictatorial leadership of the VVD elite towards her personal failed membership. To me it is unclear why ‘De Telegraaf’ chose to use this header, because it makes her story, that they want to sell, less trustworthy. Or do they sell more newspapers by bullying certain people that they want to have an interview with. Because in the future people will think twice when De Telegraaf asks them for an interview! Schuck, Andreas T, and Feinholdt, Alina. ‘News Framing Effects and Emotions’. 15 May 2015. 1-15. Telegraaf. 25 september 2017. Paper. Every day the ‘Volkskrant’ has a topic which is called ‘uitgelicht’ (highlighted). In this topic, mostly placed in the middle of the newspaper, they show the news or ordinary reports that normally you can’t find in a newspaper. Yesterday (Tuesday 19th September) they had a story about a cultural festival in Niger. And today (Wednesday 20th September) they came with a story about teenage girls that were preparing for battle in the independent republic Nagorno-Karabakh. Personally I love these stories. For a short time it feels like that you can escape reality while being right in it and you learn more from these stories than from the every day news. People love these stories because they are genuine. And authenticity becomes popular in every sphere and every sector of life. But if you would follow the rules of Galtung and Ruge in ‘The structure of foreign news’ these stories wouldn’t be valued good enough to get published. These stories are not ‘big’ stories, it has not hit the headlines yet and they are not stories where you can yourself identify with! So would the hypotheses of Galtung and Ruge become outdated if the urge for authenticity becomes greater? Or can’t you consider these stories as news and do they therefore not reach Galtung and Ruge requirements? Lanting, B. ‘Klaar voor de strijd’ (20-09-2017 de Volkskrant) https://verhalen.volkskrant.nl/nagorno-karabach#11131. Vos, C . ‘Lowlands’ in de woestijn van Niger’ (19-09-2017 de Volkskrant) https://www.volkskrant.nl/foto/-lowlands-in-de-woestijn-van-niger~p4517199/. Should we start limiting the development of artificial intelligence? This week, Sam Levin wrote an article in the Guardian about a machine that could accurately guess whether people are gay or straight based on photos of their faces. If this kind of tools get in the wrong hands it can be used for the wrong purposes. Governments that continue to prosecute LGBT could use the technology to out and target populations (Guardian). The question should be raised, do we want this new technologies? And if no, how should and could we stop it? Should the government introduce legislation to limit the development of new technologies or can we trust the market that they can regulate themselves? Caplan, Robyn and Boyd, Danah (2016) ., Who controls the Public Sphere in an Era of Algorithms’. Data&Society Research Institute. 1-19. Cellan-Jones, Rory. Stephen Hawking – will AI kill or save humankind? (BBC 20-10-2016).